Two people were shot to death in Jamaica Plain and a third was stabbed. 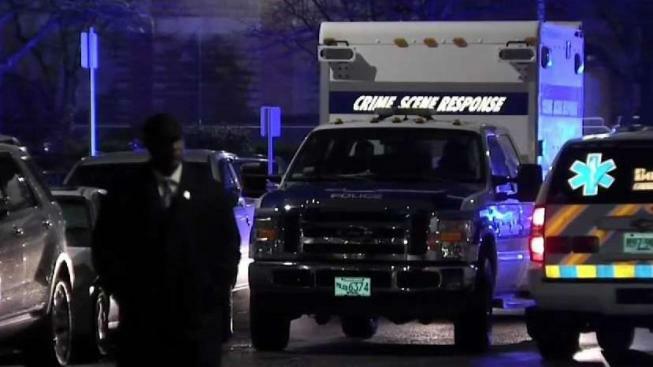 Two people are dead and one is injured after a shooting and a stabbing Monday in Boston's Jamaica Plain neighborhood. Police responded to a building on Bickford Street, where a shooting was reported around 5:50 p.m. A female victim was shot multiple times. A man was found with a gunshot wound and pronounced dead, according to Boston Police Commissioner William Gross. The female victim was taken to a hospital, where she later died, police said shortly before 10:30 p.m.
A second male was also stabbed. He suffered non-life-threatening injuries. All three people were found in the hallway of the building. Police believe all those involved were known to each other. They are all believed to be in their 30s. Anyone with information is asked to call 1-800-494-TIPS or 617-343-4470.